In my previous post I discussed some similarities between two of my hobbies, tasting wine and enjoying (or trying to enjoy) audio equipment. In the audio world, there are certain products that are looked upon as "snake oil," meaning they promise to improve the listening experience even though they are of no real value. Some people pay literally thousands of dollars for cables and even power cords because supposedly these things make the system sound better. People also buy "cable risers" - little blocks of wood that you put on the floor and then put the cables on top of them instead of letting the cables lie on the floor because the manufacturers claim letting cables be on the floor causes interference with the signals running through them. Then there is a big deal made about the materials used for such risers. Some people claim to hear significant, "jaw dropping" differences between cables, and even power cords, and between using versus not using cable risers. Personally I feel that's a bunch of baloney. So you have miles and miles of regular wire coming into your house from the electric company and then some three foot long $10,000 power cord that goes from your wall outlet to the back of your preamplifier or amplifier, which inside of it has regular wire connecting everything, and that makes a huge difference in the sound??? Yet, like Fox Mulder in the X-Files, some people want to believe. And they will tell you they hear the difference. They figure it costs so much, it must be better. Or, some "expert" proclaims it to be, so it must be. Anyway, this blog is supposed to be about wine and not about audio, but I find the same thing happens in the wine world. No one wants to appear stupid, so they go along with whatever the crowd says, even if that isn't what they themselves believe. Some time ago I did a review of a product and declared that I could not detect a difference in the wine that was processed by this product versus wine that was not processed through this product. Then I got a rude, insulting comment from the inventor who basically said I don't know what I am talking about. Just so I don't get another rude comment from this rude fellow, I won't name the name of the product but let's just say you pour the wine through it, it supposedly dramatically aerates the wine and thus the wine emerging from this product has been properly aired and thus has become more open, aromatic and just plain better. I don't even remember the name of this product anyway, but I do still have it (don't use it). It looks really good. 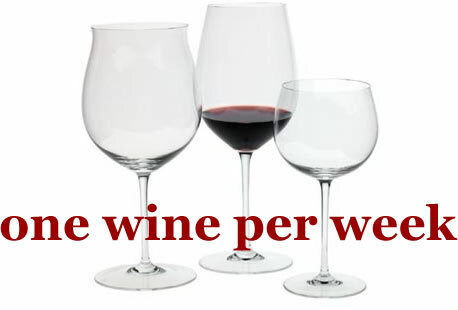 Logically speaking, just how different is doing that versus swirling the wine in the glass for aeration? To me it is no different than putting on that $10,000 power cord for your amplifier, although this product costs much less than that. Popular opinion is that it works. I'm not going to question the people who say it works since their nose isn't my nose and their palate isn't my palate, but as I said, logically speaking why should the results of using that product differ from just swirling the wine? The person I mentioned in my prior blog post who describes wine by Parker's score told me he can detect the difference. I can only point to my own experience and say I could not. But, if I were with a big group of people and then someone declared that he or she was wowed by the product because it really "opened up the wine" then I would be hard pressed to say I couldn't tell the difference myself, especially if other people started chiming in that they, too, could tell the difference. I'm only going by logic that I feel supports my own experience. Hey good for you to have the guts to state your opinion and stand your ground. Having the ability to do that is important, especially when discussing a completely subjective matter like the difference aeration makes to wine (or power cables for audio). That said, I have experienced the difference power cables made. In particular, it was a blind test changing power cables (with "fake" switches in between) for VTL amplifiers in front of a pair of Wilson Sophia speakers. Everything else being the same (source, all other cables, etc) there was a noticeable difference to me. As to why, I don't know especially as I agree with your logic that the last 2 feet of cable that's delivering power from hundreds of miles away can't matter. But it did. And it's all subjective. And as for aeration (along with stemware, speed of pour, etc) - who knows. I know when I can taste difference, and by the way, aeration doesn't always make the wine better. Ultimately, it comes down to "did that make you happy?" If yes, then great! If no, then try again!